In nineteenth-century France, sixteen thousand hectares of vineyard spread across Lower Corrèze. Count Firmin de Janelles rules over Chantegrêle. The Madelbos and Pierrebrune families detest one another, and the advent of Napoleon III awakens the hostilities between the village Bonapartists and Republicans. Meanwhile, the count is in financial ruin because of a devastating insect ravaging the vineyards. But amid the decline of the Empire, a powerful love between Alain Madelbos and Albine Pierrebrune blossoms. This unexpected union will bring about the alliance and reconciliation of the warring townspeople while Republican idealism triumphs and a new breed of landowners emerges. The setting of this family saga, epic novel, is 19th Century duringthe rein of Napoleon III. The story revolves around Count Firmin de Jandelles whose family has owned has owned 600 acres of vineyards over many generations. The surrounding townsfolk have always worked for his family. A traditionalist at heart, the Count holds strong to the old ways, refusing to make improvements through better machinery and more efficient methods. Meanwhile, the people of Chantegrele are torn over old rivalries and tensions have increased, dividing those who support the Republicans and those who support Napoleon. In this ambitious novel, the characters are both numerous and complex. There are families, townsfolk, the nobility, and several political aspects to follow. I very much enjoyed the character of the Count. He was well drawn out – he is strong, stubborn, and set in his ways, and of course, a little on the shady side, which made him very interesting. Had the book had fewer characters, it may have been a little easier to read. Despite this, there is a good grasp of historical detail and the surrounding political turmoil of the time. 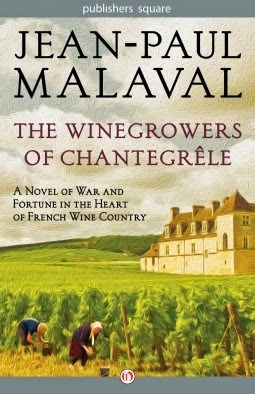 The cover is spectacular and I loved the romantic setting in the vineyards of France. For readers who love French historical fiction and the Napoleonic period, this is definitely rich enough for your tastes. An enjoyable read by a talented author.